In a 1st and 2nd grade classroom at Glenview Elementary in Oakland, students are discovering the art of oral storytelling. Students are learning how to command a stage, use tone and gestures to captivate an audience, and effectively communicate stories. These invaluable skills are being taught over a 20 week period by elder storytellers who volunteer with Stagebridge, a program that aims to share the rich experiences of elders. 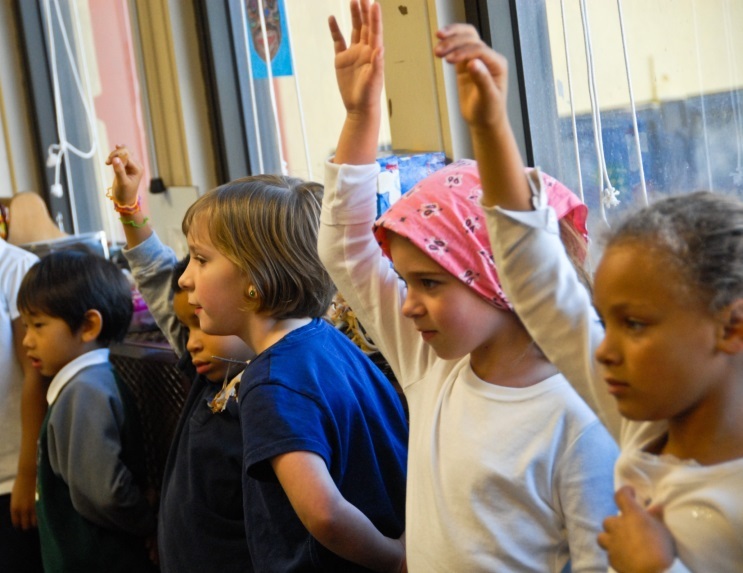 Through Stagebridge’s classroom initiative, Storybridge, storytellers are placed in classrooms to spread the joys of oral storytelling as well as develop listening and language skills in at-risk youth. PVF has funded Storybridge classroom experiences through our Visiting Artist in the Classroom Program, which brings in artists from the community to provide inspirational arts education to students. The storyteller currently working at Glenview was funded in part by a Visiting Artist grant; we provided a grant of $500 each to two Glenview teachers to cover preparation, materials, and presentation costs. We recently visited Glenview to see the artist in action. It was the first day of the 20-week program, and the day’s storyteller was Beverly Harris, who has been telling stories with Stagebridge for 5 years. After her few weeks in the classroom introducing students to the art of storytelling, a master storyteller will fill up the remainder of the sessions, helping the students tell their own stories. This master storyteller knows almost 200 stories by heart. Students at Glenview Elementary eagerly participate in the Storybridge Program. Ms. Harris created an interactive atmosphere that was enthralling for adults and children alike. She performed “The Giving Tree” by Shel Silverstein and used it to segue into a talk about the importance of give and take in relationships. Students eagerly raised their hands when she asked questions and were engaged during her story. They are no doubt excited about stepping into her storytelling shoes to express their own stories and experiences. Oral storytelling is a powerful tool for intergenerational learning and artistic expression. Our Visiting Artist in the Classroom program endeavors to expose youth to art forms like storytelling that have the ability to inspire and educate. This entry was posted in Uncategorized and tagged art, education. Bookmark the permalink.